3. 9-way cable for GPIO & power connection; leaves other pins free, and gives 20 cm cable length to position the display in different case shapes to your own preference. You may still need to take account of the pin numbering in the modules file. A. Download fresh image of the latest version of Raspbian (tested with 2015-02-16) by Notro with the FBTFT drivers available as loadable modules. (2014-06-20-wheezy-raspbian-2014-07-25-fbtft-master-firmware.zip) https://github.com/notro/fbtft/wiki#image-download). B. On the first boot, setup locales, your timezone and enable the camera using the config program (sudo raspi-config). It’s worth knowing that the screen will go blank after 30 minutes to protect it, if there has been no activity on it (actually important on these small TFTs). Check out this information if you need to change it. 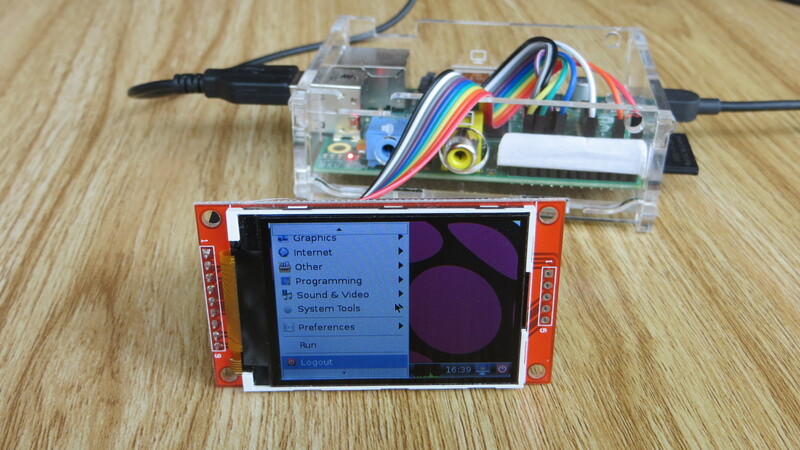 F. If you restart your Pi, you should now have the console viewable on the mini-TFT! NOTE (25/112015): This command is not working on latest versions of Raspbian as it hardwires x to use fb0. Please see this page for tips on how to edit your settings to get displaying on the TFT. It’s better to resize any video you want to play in advance (with ffmpeg or freemake video converter), you can look at the mplayer options to resize on the fly (mplayer -vo fbdev2:/dev/fb1 -x 320 -y 240 -vf -zoom yourmoviefile.mp4), but the raspeberry pi is not powerful enough to handle it, so your video will play too slowly. You can edit the script using nano – check out the pygame website for instructions for how to draw other shapes! I’ve created a python class to help easily graph you data and display it on the AndyPi TFT. You’ll need to download this class AndyPiPlot.py, and install python & python-setuptools python-matplotlib and python-scipy (use pip). You’ll be able to make a scatter plot, a single line plot and a plot with 2 lines and a legend (see example below), and set up all the axes and titles etc. You can load the data from csv files (using the readData function in the AndyPiPlot class), or directly put in the variables for your script.